Gate2018online.IN: ISRO Last 10 Years Questions Paper in PDF|| Direct link to Download. ISRO Recruitment 2017 for Scientist/Engineer `SC’(Group ‘A’ Gazetted Post). Exam date of ISRO 2017 is 07 may 2017. Answer Key is now released in ISRO official website and also this questions paper and answer key is Available at our website. Previous Year asked Electrical Questions Paper in PDF has been uploaded @ www.gate2018online.in i.e. at our website. you download easily ISRO Last 10 Years Questions Paper in PDF format which will be useful for upcoming ISRO exam. RECRUITMENT OF SCIENTIST/ENGINEER `SC’ WITH B.E/B.TECH OR EQUIVALENT DEGREE IN CIVIL, ELECTRICAL, REFRIGERATION & A/C AND ARCHITECTURE. (i) Civil; (ii) Electrical; (iii) Refrigeration and Air Conditioning and (iv) Architecture. Electrical and Electronics Engineering in First Class with minimum of 65% marks. registration mode and registration will start from 22.02.2017 and last date is 14.03.2017. BE/B.Tech or equivalent qualification in first class with an aggregate minimum of 65% marks or CGPA 6.84/10 (average of all semesters for which results are available). The written test will be conducted on 07.05.2017 at twelve venues viz., Ahmedabad, Bengaluru, Bhopal, Chandigarh, Chennai, Guwahati, Hyderabad, Kolkata, Lucknow, Mumbai, New Delhi and Thiruvananthapuram. will be eligible for consideration for empanelment in the selection panel, in the order of merit. The candidates may raise objections with valid justifications, if any, within 5 days (i.e. on or before (15.05.2017) of publishing the answer keys in the web-site. We will soon update ISRO electrical 2015, 2014 and 2013 & many more Asked Questions Paper. 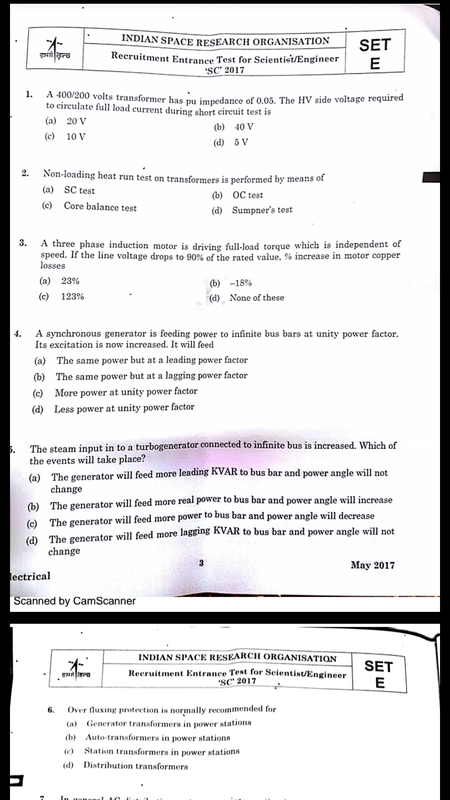 Below we have updated ISRO Electrical & Electronics Engineering last 10 year Questions Paper in pdf form. Direct link has been given to you. Just by one click ISRO aspirants can download in easy step.